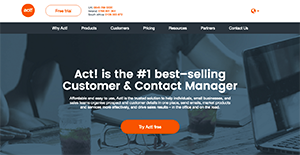 Contact and client management app Act! is designed to cater to SMBs, serving as a central repository for information such as account history, contacts and client activities. The software allows users to manage prospects, track interactions and take down notes–all from a single platform, eliminating the need for multiple systems. It comes loaded with all the needed marketing and sales automation tools that would benefit businesses of all sizes and types. Act! has applications for sales and marketing automation and is suitable for companies in various industries. Through lead and opportunity management features, you get a comprehensive view of prospects and customers as well as help you handle lead data, contact details, and potential opportunities. Act! lets you connect to contact details and editions and track interactions and relationships including opportunities and status, among others. It enables your sales teams to classify customers so they can deliver personalized email campaigns with targeted content and messages. You can keep track of events and schedules with a shared calendar built into the software. In addition, Act! applies automation to repetitive tasks to further improve efficiency and productivity. You can put on dynamic auto mode sales processes, schedules, alerts, assignments and many other activities. You can also segment and prioritize email contacts as well as track and measure performance with dashboards and reports on lead sources, status, campaigns, etc. The software offers several features to monitor clients, employees, competitors, and many other capabilities to drive your company forward. No matter where you need your data to be stored, the software offers both on-premise and cloud-based solutions in clean and intuitive layout for easy navigation alongside extensive integrate so you can work with others apps right within the CRM platform. Enterprises have different wants and requirements and no software application can be perfect in such a scenario. It is futile to try to find a perfect out-of-the-box software system that fulfills all your business wants. The intelligent thing to do would be to modify the application for your special wants, staff member skill levels, finances, and other aspects. For these reasons, do not rush and invest in well-publicized trendy applications. Though these may be widely used, they may not be the best fit for your particular needs. Do your research, check out each short-listed platform in detail, read a few Act! reviews, contact the vendor for explanations, and finally settle for the application that offers what you require. How Much Does Act! Cost? We realize that when you make a decision to buy CRM Software it’s important not only to see how experts evaluate it in their reviews, but also to find out if the real people and companies that buy it are actually satisfied with the product. That’s why we’ve created our behavior-based Customer Satisfaction Algorithm™ that gathers customer reviews, comments and Act! reviews across a wide range of social media sites. The data is then presented in an easy to digest form showing how many people had positive and negative experience with Act!. With that information at hand you should be equipped to make an informed buying decision that you won’t regret. I consider this to be the greatest CRM ever! A fantastic approach in having your contacts sorted out. My personal take on this software. Trying to be familiar in knowing and using ACT. What are Act! pricing details? What integrations are available for Act!? Pros: Act! is one heck of a software. A lot of its functionality are simply great! First off, I can nearly manipulate my database with the software itself. The remote database sync is simply great! Cons: Things would've been twice as reliable if you're running your own e-mail or word processor as opposed to Microsoft Outlook in passing through. Act! previously had things with more integration. It would've been nice if that was brought up to speed. It seems Microsoft is done playing nice. Pros: It's been around for decades, under different ownership. I have used it for over 20 yrs. I was hopeful when Swiftpage bought it. Has a lot of customizable features and layout options. It is functional and pretty intuitive. Cons: It is slow. It doesn't have a MAC version, so you have to rely strictly on the web version, which is very slow and quirky. When they recently did a major database host conversion to Google, it has essentially made my database unusable. Customer support apparently isn't willing to help me through the problem they created, as they will not contact me after several emails requesting help. Customizing it is simple. I can really work with this. It's highly portable. I can use it on any device regarldess if it's a smartphone, tablet, laptop, or desktop PC. Our business was able flourish thanks to Act! Being able to make customizations. Getting this system to specifically meet our needs. We've used a lot of CRMs in the past. And we've made it right back to using Act! A fantastic contact database best used for today's enterprise. Dealing with all my contacts. A highly effective system for doing things. If you need more information about Act! or you simply have a question let us know what you need and we’ll forward your request directly to the vendor.